Our Bay Area Teen Science (B.A.T.S.) program aims to provide San Francisco Bay Area teenagers with the most up-to-date information available on current STEM learning and career building opportunities. Some of the best science, technology, engineering, and mathematics (STEM) programs, internships, and events for teenagers in the country are in the Bay Area, including many that are completely free for participants. Yet, far too often large numbers of local teens remain unaware of them, or find out about them too late. But through the B.A.T.S. network of STEM education providers and other connections, we’re in a position to alert Bay Area teens to these opportunities as soon as they are announced. In fact, for years now, these "breaking news" alerts have been regularly posted on our Facebook page and home page. However, a survey of almost 700 Bay Area teenagers made it clear that teens would prefer to get such information through email, and so we responded with the Opps For B.A.T.S. newsletter! February 2nd is celebrated in the United States as both Groundhog’s Day and Candlemas, or Dia de la Candelaria in Spanish. Both celebrations have their roots in astronomical events. Candlemas (Dia de la Candelaria) is a Christian celebration of the presentation of Jesus at the temple in Jerusalem, commemorating Mary's ritual purification after her childbirth. Following ancient Hebrew tradition, this took place 40 days after Jesus was born. Therefore, Candlemas is now celebrated 40 days after Christmas (Dec 25) on February 2nd. Some people do not remove Christmas decorations until this date, as it marks the end of the Christmas season. These dates are where the first astronomical connection comes into play. Our Eclipse Megamovie Project is a first-of-its-kind citizen science project that enlisted thousands of volunteers from locations across the United States to capture images of the August 21, 2017 total solar eclipse. These individual photos are being stitched together to give us an extended look at the sun’s atmosphere. We’ve always intended to make these images public as well, and we’re pleased to announce that the first of many access points is finally available! Do you have any questions about the eclipse to ask leading solar scientists? This week, Oct. 23-27, post any sun-related question for NASA Solar Week. Or you can ask a question on Twitter, or email. Were you along the path of totality for the total solar eclipse on August 21, 2017? If so, we hope you participated in the Eclipse Megamovie Project! We wanted as many photos of the eclipse as we could gather, and created a special upload site for the public to submit their photos (such as the beautiful composite at top left). Here are three ways to watch the incredible results. First, a mini-documentary from Google: Chasing Totality: the Making of the Eclipse Megamovie. Next, The Crowd & The Cloud also made a road trip from Charleston SC to Dubois WY to hear from many of the enthusiastic volunteer photographers contributing to the Eclipse Megamovie project. And here is a 360 degree video capturing the event in virtual reality! If you will be along the path of totality for the total solar eclipse on August 21, 2017, then we hope you can participate in the Eclipse Megamovie Project! We want as many photos of the eclipse as we can gather, and we will have a special upload site for the public to submit their photos. You don’t need special equipment to be part of history. You can also use apps like the free Eclipse Megamovie Mobile app (available now on Android and iOS) to plan for the eclipse, automatically take photos, and share images and data with project scientists. Ask anyone in the United States to picture a space scientist, do an internet image search for ‘scientist,’ ‘astronomer,’ or ‘physicist,’ or open up a children’s book about different careers and you will overwhelming get pictures of white men in white lab coats holding flasks of colored liquids. Putting aside the colorful liquids and lab coats, why are they mostly white men? The truth is, if the average American has ever encountered an actual space scientist they probably were a white man. About 80% of space scientists in the United States are men, and 80% are white. Full Spectrum is a documentary film project telling the stories of research scientists and engineers who identify with groups underrepresented in the space sciences in the United States (African Americans, Latinos, Native Americans, Asians, Women, LGBTIQ people, and persons with disabilities). 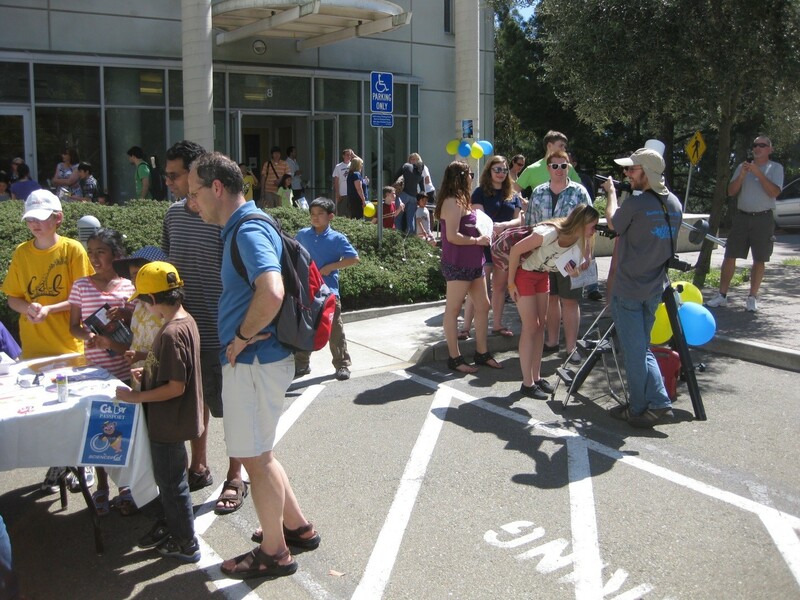 This March, Multiverse's Bay Area Teen Science (B.A.T.S.) initiative is hosting two major events. First, all Bay Area high school students are invited to the FREE B.A.T.S. Teen Career Conference on Saturday, March 18th at the San Francisco Zoo & Gardens. Visit the Teen Career Conference web page for full details and to register. The second event is for education professionals who provide STEM learning and career building opportunities for San Francisco Bay Area teenagers through afterschool and other "out-of-school time" programs, and for those who want to better connect with this community. This first ever B.A.T.S. Professionals Conference is also free to attend and will be held Tuesday, March 28th at UC Berkeley. Visit the Professionals Conference web page for additional details and to register.